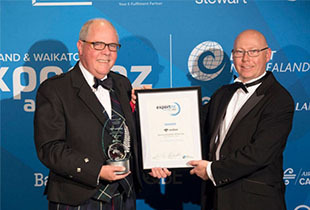 We are delighted and proud to announce that ICL Education Group won the award for Endace Services Exporter of the Year 2016 at the Export NZ awards held in Auckland on 23rd June. This is a tremendous achievement, and testament to the hard work and success of the 100 staff of ICL Education Group. This category was judged against the following criteria: the general background of the company; foreign exchange growth; planning, leadership and direction; excellence in marketing and production and capacity. ICL’s strategy of extending the range of educational offerings through acquisitions as well as generic growth, and the focus on maintaining a strong ethical base in course delivery, has positioned the company well. The judges also noted that the Group has a well-developed governance structure. The judges were impressed with ICL’s approach to marketing, with a broad spread of target markets, and the introduction of new courses to meet identified demand, particularly at a post-graduate level. The decision to retain separate identities for the different education sectors now serviced by ICL is wise and the rebranding of the advanced business course offerings as ICL Graduate Business School should assist in attracting a new cohort of students. It is clear that ICL is a strong contributor to New Zealand’s success in continuing to attract fee-paying international students. ICL’s research culture and policy of employing and retaining highly qualified staff is also a positive factor. We thank Endace for its kind sponsorship of this award. 2015 saw ICL grow to its largest ever, and we thank our energetic staff, our advisory boards, our university pathway stakeholders, the government agencies which support us and our many representatives worldwide, who have all helped us achieve this outstanding result.